According to culinary folklore, if workers in the kitchen want to celebrate a positive outcome, a common victory cry is “Winner, winner! Chicken dinner!” The same requiem can be heard at the race track betting windows when a winning wager is cashed. The chant is believed to have originated in Las Vegas where, for many years, it was quite common for casinos to serve a three-piece chicken dinner with a potato and vegetable for $1.79. A win bet at the window costs $2, so for the price of a winning wager, one could buy a hearty chicken dinner. But just like thoroughbreds, not all chicken dinners are created equal. In 2016, when Creator won the Arkansas Derby, noted celebrity chef Bobby Flay (who would soon buy an ownership stake in the Tapit-sired three-year-old just in time for the colt to pull an upset and win the Belmont Stakes) was serving up a chicken dinner in his Manhattan restaurant, Bar Americain. One of the most ordered menu items year-round, Bobby’s chicken dinner is filled with delicious seasoning, moist and tender meat, and a gloriously crunchy outside coating. His trademark bold-flavor cookery made the widely recognized BMF (butter milk fried) chicken dish popular, while chipotle-infused collard greens, perfectly textured mashed potatoes and black-pepper buttermilk biscuits accompanied the yard bird, setting it apart from hundreds of others in New York City. Rooted in Southern culture, Arkansas has its own flavor. And there’s not much that’s more southern than horse racing and fried chicken. On Saturday, Oaklawn Park will once again close out its thoroughbred racing meet with the final major prep race for the Kentucky Derby. Run over 9 furlongs, the Arkansas Derby, a Grade 1 race with 170 Derby points (100-40-20-10) awarded to the top four finishers, serves up a $1,000,000 purse and lots of opportunity to the horses and their connections hoping to parlay a win into the starting gate of America’s most celebrated test for young thoroughbreds in May. 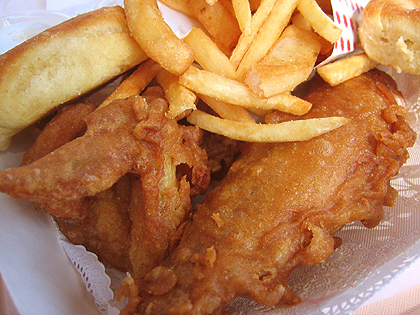 The race, first run in 1936, is as traditional to thoroughbred fans worldwide as fried chicken has become across the globe. Four Arkansas Derby winners have gone on to win the Kentucky Derby. Concern won the race in 1994 with the late Garrett Gomez aboard, and later captured the Breeder’s Cup Classic with Jerry Bailey in the irons. The most celebrated Arkansas Derby champion is American Pharaoh, who not only became the 12th winner of the coveted Triple Crown of racing, but was the first to do so in 37 years. Seven Arkansas Derby winners have gone on to win the second leg of the Triple Crown (the Preakness Stakes) and, since 1980, six other winners have gone on to win the Crown’s final leg, the Belmont Stakes. Retired jockey and NBC television’s thoroughbred racing commentator Pat Day holds the record for the most wins in the race at three. Todd Pletcher, who enters second favorite Malagacy this year, holds the record for the trainer with the most wins at four. Malagacy comes to the Arkansas Derby after having won the Grade II Rebel Stakes in March. American Pharaoh took that same path on his triumphant road trip to the Kentucky Derby, winning both the Rebel Stakes and the Arkansas Derby. On a Derby trail that has been anything but linear this year, twelve horses take their shot at history and vie for the coveted points they need to enter the Kentucky Derby starting gate. For some, this race is the last chance for a shot at the blanket of roses in May. Honey’s Kettle fried chicken (photo via thedeliciouslife.com). * ROCKIN RUDY will become the second starter for Team O’Neill and J. Paul Reddam, who won a berth with Irap in last weekend’s Blue Grass Stakes. Rockin Rudy broke his maiden in his first try at Del Mar and finished second in his last two starts over Santa Anita Park’s downhill turf track. Expected to be a pace factor, he’s earned speed figures that make him a factor. 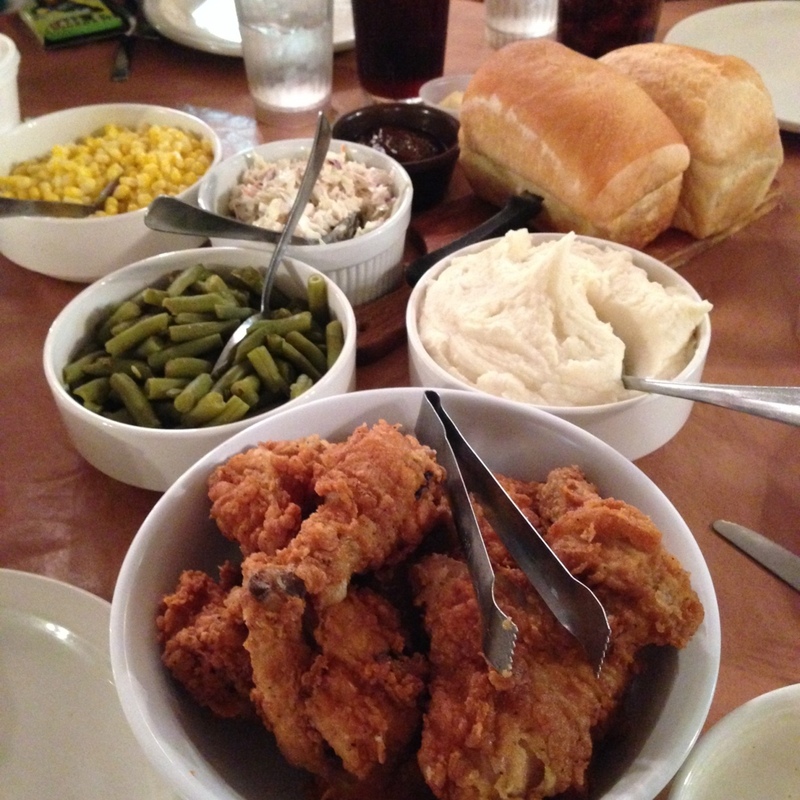 Honey’s Kettle in Culver City, California is a great stop for a winning fried chicken dinner in Cali! With over 40 years of experience and a coating impervious to heat, the honey drizzle would be sweet, just like having a second starter at Churchill Downs would be for these winning connections. 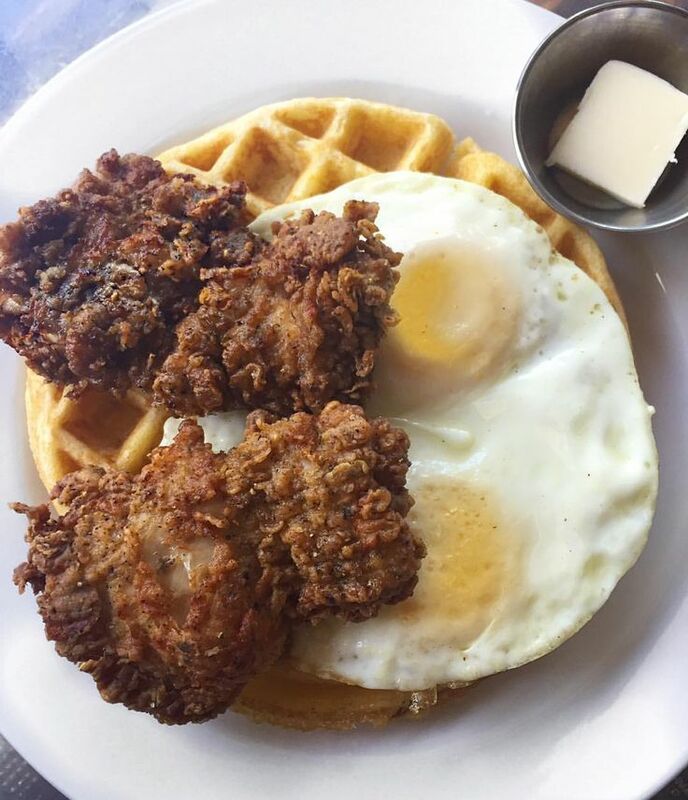 Chicken n’ watermelon n’ waffles (photo via the New York Times). * CLASSIC EMPIRE is last year’s champion two-year-old male. With 32 total points, this son of Empire Maker is currently ranked 21st in the Derby standings and must finish well in order to make it to Churchill Downs. A road worth traveling generally has its rough spots and challenges and this colt has seen his share. Plagued with a foot abscess and back problems, according to his connections, he seems to be returning to winning form and looks to be ready to run a good race. Yardbird Southern Table & Bar in Miami, Florida is worth a trip to investigate. 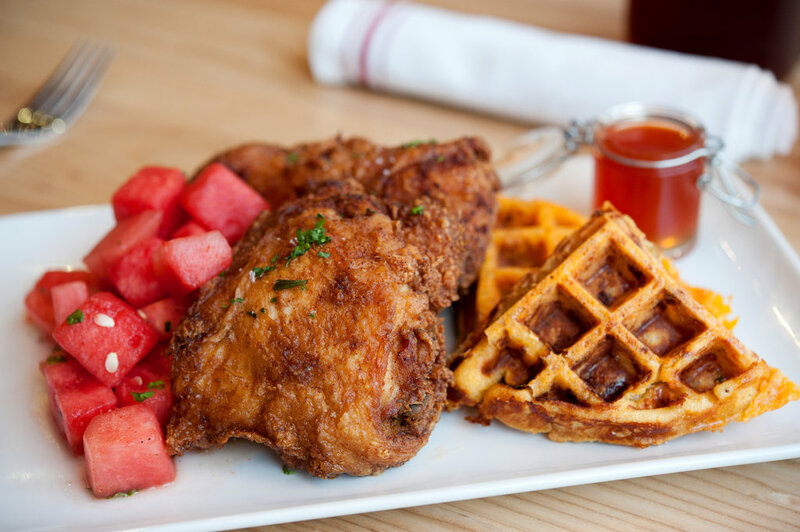 Try the chicken n’ watermelon n’ waffles, featuring hot sauce honey, chilled spiced watermelon, a cheddar cheese chow-chow waffle, and bourbon maple syrup. The Skillet Restaurant (photo via pinterest.com). * SILVER DUST needs to finish first or second in this race to ensure his spot in the Kentucky Derby starting gate. The son of uber-sire Tapit has but one point heading into the Arkansas Derby. Trainer Randy Morse, currently ranks 10th in wins and 11th in earnings at Oaklawn Park. A deep closer with a late running style, this colt has worked well since finishing fifth in the Rebel stakes, which earned him a 101 Equibase Speed Figure. 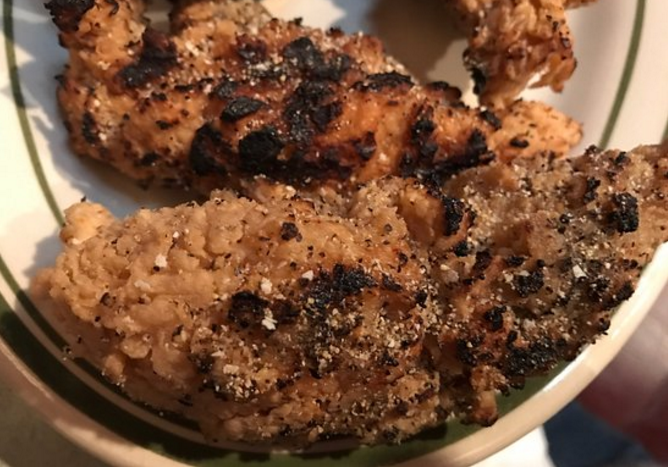 For good Ozark-style fried chicken, seasoned with paprika, salt, black pepper and a lot of buttermilk, The Skillet Restaurant in Mountain View is considered one of the best. And you can tour the Ozark Folk Center when you’re done licking your fingers. 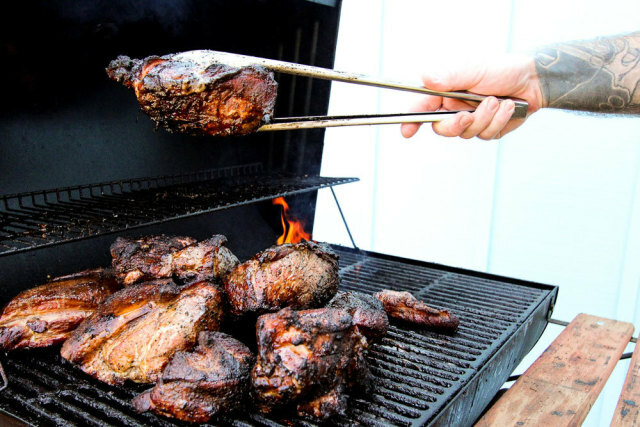 Chicken Over the Coals chicken dinner (photo via tripadvisor.com). * PETROV needs to finish at least third here in order to keep moving forward to the Derby. His trainer Ron Moquett currently ranks second in earnings and fifth in wins at Oaklawn. Jockey Ricardo Santana, Jr. is a top rider at Oaklawn as well, currently leading in both earnings and wins. He’s looking to win his fifth consecutive leading rider title at the track, and he piloted the Arkansas Derby winner Creator in last year’s race. It might be appropriate to break from tradition and go to Chicken Over The Coals at AQ Chicken House in Springdale. Strong seasoning, hints of lemon pepper, slightly blackened, almost Creole-style, and considered one of the most decadent plates of chicken in Arkansas, this 75 year-old establishment has no problem deviating from tradition. Monte Ne Inn meal (photo via trover.com). * GRANDPA’S DREAM fought hard to break his maiden with new rider, Alex Canchari, aboard on March 25. The son of Shackleford also has the leading Oaklawn trainer in 2015, Chris Hartman, in his corner. Originally from Phoenix, Arizona, Hartman comes from a racing family and has enjoyed success at several tracks, including a trip to the Breeder’s Cup with Alsvid in 2015. 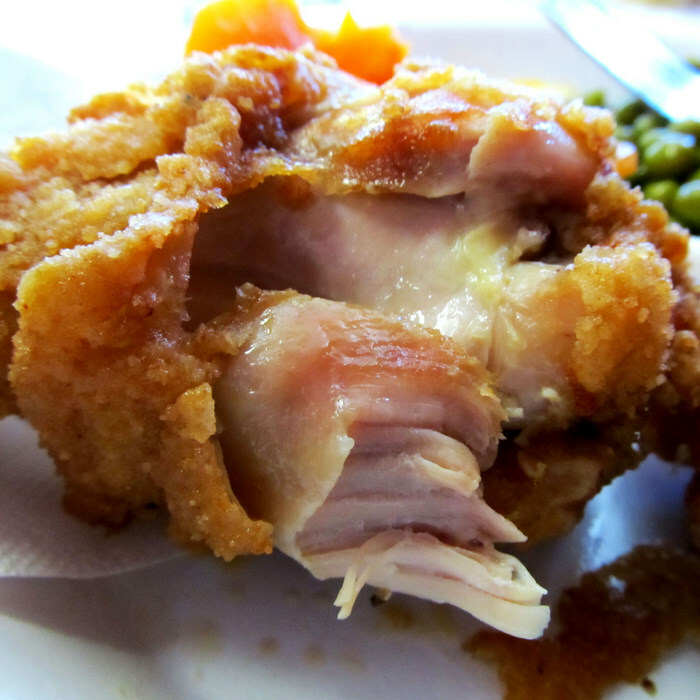 Arkansas’ Monte Ne Inn Chicken Restaurant, a family-style sit-down-and-pass-the-plate kind of place offer a russet red crust on its batter-tight fried chicken. Lots of paprika, black pepper and a proprietary seasoning give this chicken a unique and supple winning flavor. Myrtie Maes chicken (photo via the Arkansas Times). * LOOKIN AT LEE has 12 Kentucky Derby qualifying points currently and will need to run his best race on Saturday. It helps to have three-time Arkansas Derby-winning trainer Steve Asmussen leading the way, as he did with Private Emblem in 2002, two-time Horse of the Year Curlin in 2007 and last year’s winner, Creator. Watch out for wet elbows, if your winning chicken dinner is the moist fried chicken served up at Myrtie Mae’s in Eureka Springs. Buttermilk batter, light, golden brown and delicious, the long-time recipe is said to have been developed by Myrtie herself when travelers stopped by for fun at her home in the Ozarks. Willie Maes chicken dinner (photo via seriouseats.com). least third for his connections to feel excited about his Triple Crown bid. Still a maiden in this anything-can-happen-and-oftentimes-does journey, his trainer and rider are no strangers to winning classic races. 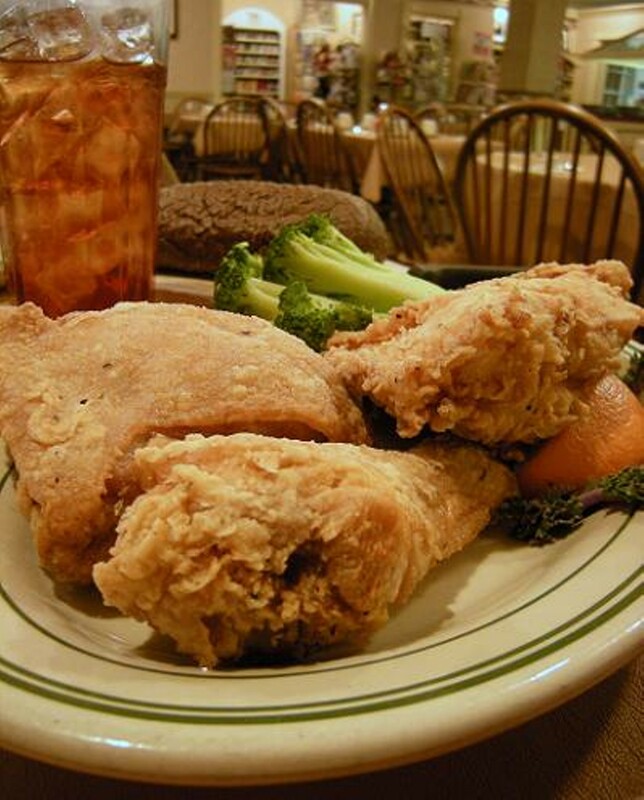 A well-deserved classic chicken dinner would be in order at Willie Mae’s Scotch House in New Orleans, Louisiana. 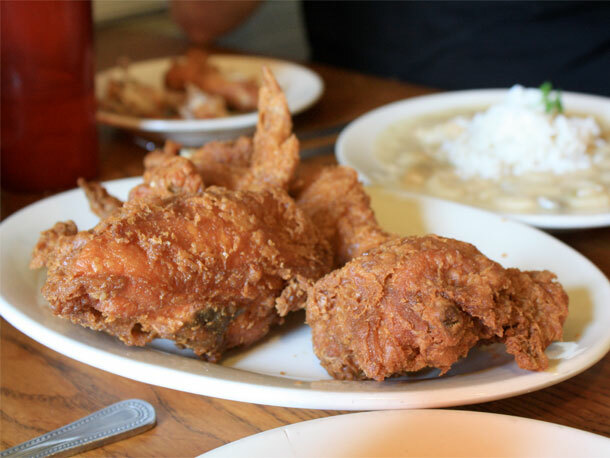 Crispy, spicy chicken with a side of salty, smoky red beans and rice is the local staple of this 50-year-old restaurant that even hurricane Katrina couldn’t stifle. Mama Dip’s fried chicken (photo via pinterest). * ROWDY THE WARRIOR is trained by Donnie Von Hemel, a well-known conditioner in the Midwest, who had some success on last year’s Derby trail, finishing second in the Arkansas Derby with Suddenbreakingnews and then advancing to run fifth in the Kentucky Derby. Rider Luis Quinonez, a seasoned Oaklawn rider had the mount in those races. A win here would warrant a trip to enjoy one of the very best fried chicken dinners in the nation, Mama Dip’s in Chapel Hill, North Carolina. Serving her lightly battered, shortening-fried half-a-chicken since 1976, Mama Dip’s country greens (a combination of collard, turnip and mustard) cooked with pork and black-eyed peas, are widely known for the flavors and textures of the Deep South. Toughest part about Mama Dip’s is not falling asleep at the table after all of that delicious food. Motor City Soul Food meal (photo via eventseeker.com). * UNTRAPPED is Steve Asmussen’s second entry in the 2017 Arkansas Derby. He will need a stellar performance here to advance any further along the Trail. 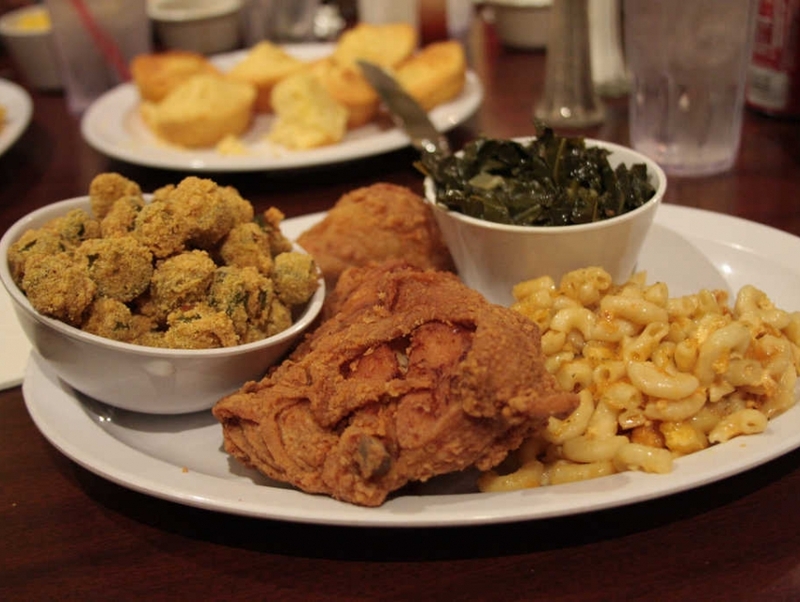 A juxtaposition of ambiance, Motor City Soul Food in Detroit, MI serves the kind of fried chicken plate that will set you free, even though it’s prepared behind bulletproof glass. Detroit-on-a-plate, this food is so good you’ll want to loosen that belt and eat everything. If you don’t save room for dessert though, you’ll be missing out on an other worldly banana pudding. Chicken from David Family Kitchen (photo via the Arkansas Times). * ONE DREAMY DUDE goes for Hall of Fame trainer Jack Van Berg, known for his management and care of the great 1988 Horse of the Year, Alysheba. Van Berg currently ranks eighth in wins this year at his home track of Oaklawn Park. One Dreamy Dude is winless in his career and would pay for a lot of chicken dinners should he triumph on Saturday. A winning chicken dinner for this group would likely be another local favorite, David Family Kitchen. 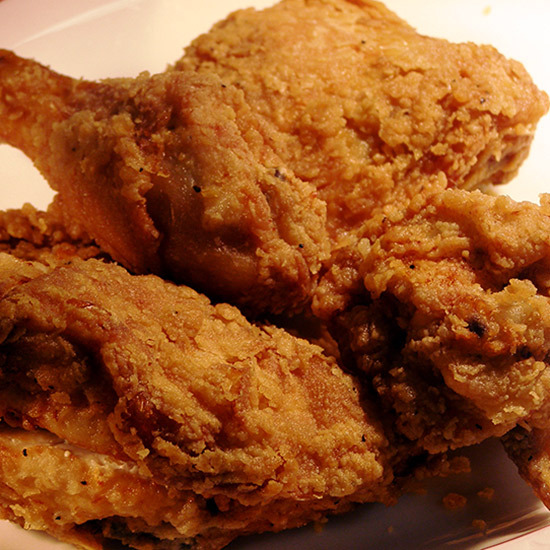 With notably large legs and thighs, the salt-and-pepper batter of this soul food café produces super juicy fried chicken. Grilled chicken from the People’s Pig (photo via pdxmonthly.com). A plate of smoked fried chicken with New Mexico green Hatch chiles at The People’s Pig in Oregon is a notably ambitious dish, but one certainly worthy of the trip. If bacon tasted like chicken, you’d come close to the perfection of this boneless delight. Chicken from the Red Rooster (photo via bandt.com.au). * MALAGACY, with Javier Castellano aboard, will break from the outside post, using his considerable talent and early speed to apply his successful strategy of sitting just off the pace, like he did in the Rebel. Another son of Shackleford, he has the pedigree to go the distance with his speed. Trainer Todd Pletcher has won four Arkansas Derbies — more than any other trainer. This chicken dinner will have a great deal of class. 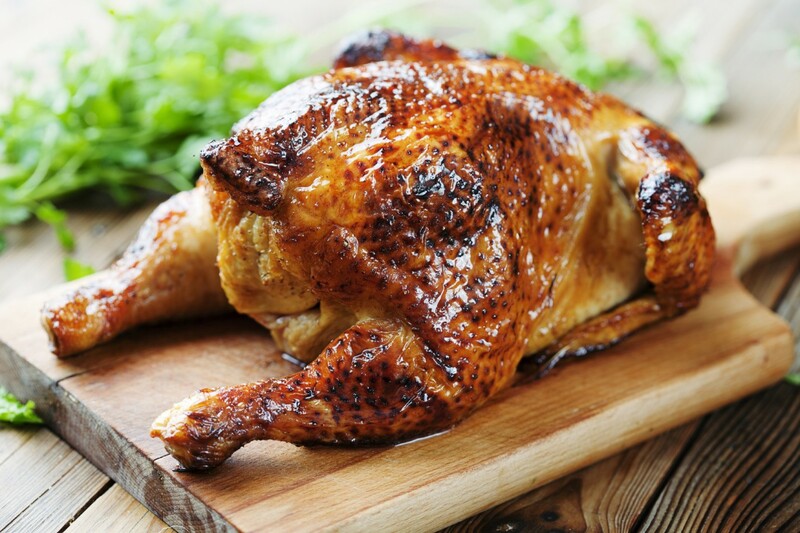 The yardbird at celebrity chef, Marcus Samuelson’s Harlem restaurant, Red Rooster, transcends all previous thoughts of chicken, by marinating the whole bird in buttermilk and Ethiopian spices and then frying it whole. The dish put Harlem on the world-wide map and inspired a complete renaissance of the historical New York neighborhood. Whether you stick with the favorites or through caution to the wind, there’s a winner in this race and a chicken dinner to match it. Dig in and get ready to lick your fingers. It’ll be that good.